Scott Gunn and Tim Schenck serve as the self-appointed Lent Madness Supreme Executive Committee (an appropriately arrogant title considering they first met as members of the now-defunct Board of Governors of the now-defunct newspaper Episcopal Life). Tim handles the overall administrator/editor-in-chief role while Scott takes care of technology and marketing. Since Tim is the founder of Lent Madness, he insisted that his bio be listed first. Unfortunately, since Scott also has the password, this may change. 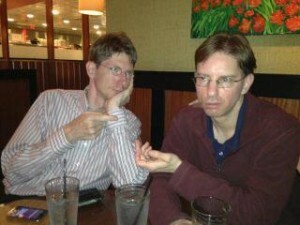 Scott and Tim both consider one another to be their online archnemesis. Lent Madness will likely do nothing to change this but hope, like Easter, springs eternal. The Rev. 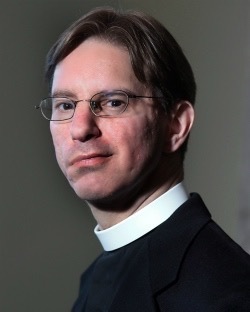 Tim Schenck is rector of the Episcopal Parish of St. John the Evangelist in Hingham, Massachusetts, on the South Shore of Boston. 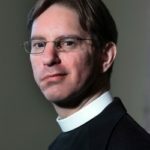 He is the author of five books full of humor and faith including, most recently, Holy Grounds: The Surprising Connection between Coffee and Faith – From Dancing Goats to Satan’s Drink (Fortress Press 2019). When not tending to his parish, drinking single-origin coffee, desperately seeking material for his syndicated “In Good Faith” column, or blogging at Clergy Confidential, he’s likely hanging out with his family that includes his wife Bryna, two teenage sons Benedict and Zachary, and their dogs Delilah and Cooper. Friend him on Facebook or follow him on Twitter @FatherTim or Instagram. The Rev. Canon Scott Gunn is a geek of both the church and of technology. He serves as the executive director of Forward Movement in Cincinnati, Ohio, whose mission is to inspire disciples and empower evangelists. Scott is also a Deputy to the Episcopal Church’s General Convention, the ultimate achievement for serious church geeks. Along with the Rev. 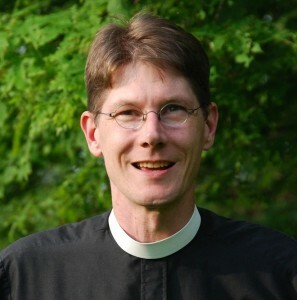 Melody Shobe, he has written two books, an introduction to Christianity, Faithful Questions: Exploring the Way with Jesus, and an introduction to the Episcopal Church, Walk in Love: Episcopal Beliefs and Practices. His blog is Seven whole days, where you’ll read church rants and raves, thoughts about technology, and random musings. You can find him on Facebook, Twitter, Instagram, flickr, or LinkedIn. Scott is married to Sherilyn, who is also a priest, and they have a dog named George (after George Herbert, the first-ever Golden Halo winner). George has his own social media presence, and he’d love it if you followed him on Instagram, Twitter, or Facebook. As members of the Supreme Execu tive Committee, Scott and Tim have many fascinating conversations both online and in-person (only when absolutely necessary). These interactions almost always involve coffee since they tend to bore one another with tedious commentary about liturgical minutiae and the relative merits of various saints. In this photo, taken after a particularly intense meeting of the Supreme Executive Committee, Scott and Tim appear to be sick of one another as they discuss St. Dymphna, patron saint of madness.